« Seed Or Sod: Which Is Best? You have probably noticed that many lawns have dead patches after a hard winter. This damage is often due to hard frosts. Turf grass is different from most other types of grasses used in the typical lawn. Turf grass is much heartier in the cold winter months, and frost alone does not damage it. 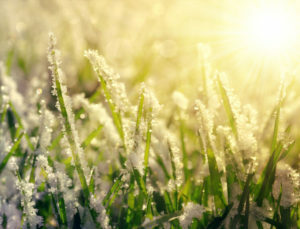 Why Does Frost Kill Grass? Frost occurs when water in the atmosphere settles and freezes. Typical grasses used in many lawns are constantly trying to draw water through the blades of grass. When frost is on the grass, it still tries to get water, and instead the frost can freeze inside the grass. This is what kills the grass in spots of a lawn. Why Doesn’t It Happen to Turf? Turf grass is different from other grasses because it pulls its water through its roots. The top one to two inches of soil should be kept moist even in the winter for this reason. Since the blades of turf grass are not trying to drink, they do not freeze within. Turf grass sod can even be installed in the winter. It will lay dormant until the weather warms up and it is able to really take root and grow. Frost itself will not kill turf grass, but you can damage turf when there is frost on the ground. It is very important that you do not walk on the turf while it is wet or covered in frost. Doing so will result in foot printing, a phenomenon where an imprint is permanently marked in the turf. Foot printing does not go away with time. The turf grass has to grow out from it and then you can mow it away. Make sure that everyone in your family knows not to be on the turf during a freeze.